Jeep Love. We Know... It’s Deep. As members of the ‘Rough and Ready’ Jeep club, several of our family members have held the position of president. We are very familiar with these vehicles and their history. Jeep's heritage is rich and deep. From the very beginning, the Jeep has fulfilled its purpose with aplomb and proficiency. At Made In America Made In Japan, we are not only passionate about them, but are familiar with their nuances as well. 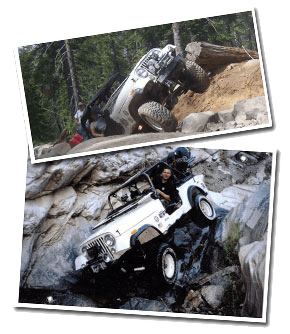 Our team owns Jeeps, and have taken them through terrains, such as Rubicon and Surprise Canyon, in the Panamint Mountain range. With that said, we honor the Tread Lightly program and only take our vehicles where the appropriate laws and regulations allow.